Three lighthouse keepers vanished without a trace from the remote island of Eilean Mor (pictured), off north-western Scotland, in December 1900. To this day, it's unknown what happened to them. The three men were James Ducat, Donald McArthur, and Thomas Marshall. Ducat, 43, had over 20 years lighthouse experience, and McArthur and Marshall were both seasoned mariners. The three were accustomed to terrible seas and safe in a brand-new lighthouse situated 150 feet (45 metres) above sea level. "Dec 12th: gale north by northwest. Sea lashed to fury. Never seen such a storm. Waves very high. Tearing at lighthouse. Everything shipshape. James Ducat irritable. Dec 12th (later): storm still raging, wind steady. Stormbound. Cannot go out. Ship passing sounding foghorn. Could see lights of cabins. Ducat quiet. McArthur crying. Dec 13th: storm continued through night. Wind shifted west by north. Ducat quiet. McArthur praying. Dec 13th (later): Noon, grey daylight. Me, Ducat and McArthur prayed. Dec 15th: Storm ended, sea calm. God is over all." There's one other thing: it was visually confirmed that there were no storms in the area the whole time. In fact, the weather had been calm. The 140,000 candlepower light went out on the same day the log entries ceased. 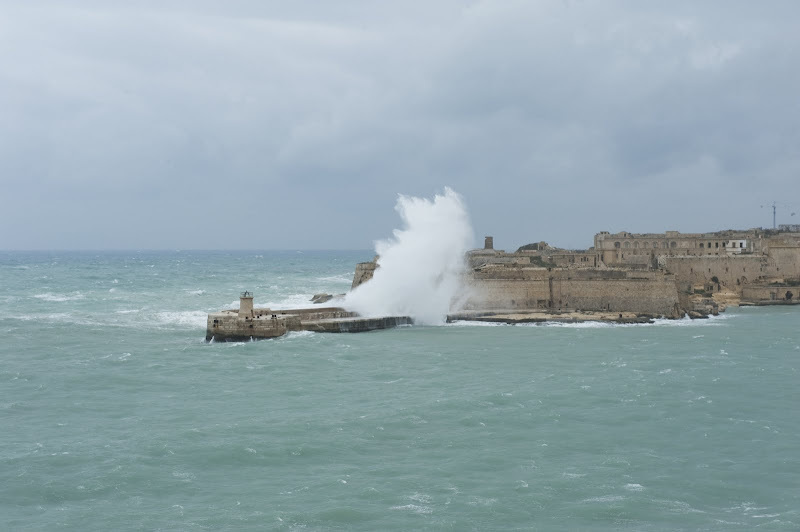 It was only much later that conditions deteriorated (December 20), preventing the island being reached by supply ship until the day after Christmas. Ducat, McArthur and Marshall had been lost. Robert Muirhead, a Northern Lighthouse Board superintendent, noted that the damage to one of the lighthouse landings was "difficult to believe unless actually seen." In a strange coincidence, the famous author Robert Louis Stevenson had written a story (The Merry Men) some years earlier with parallels with the real event that would later take place in 1900. Stranger still, the lighthouse on Eilean Mor was built by the architect David Stevenson - one of his relatives. Упали с обрыва. Встали на краю, а штормом его размыло, он и обрушился вместе со смотрителями. Так шторма то никто не регистрировал в эти дни. Michael Ermak писал(а): Так шторма то никто не регистрировал в эти дни. Приняли ржаных сухарей со спорыньей, попутали даты, и ушли с обрыва искать богов. А мотив? Сам островок просто слезы. Кто-то там где-то сильно соврал. Что это вас, Михаил, так на таинственные исчезновения потянуло, в Комкон-2 нешто играете? Хобби у меня такое. Моск тренировать. Пока идут каникулы, у меня есть несколько таких историй для ломания головы и тренировки навыков поиска в интернете. Ну и некая схожесть с моим главным расследованием - Марией Челестой. The unexplained disappearance of three Scottish lighthousemen from their lonely station in the Flannan Isles, to the west of the Outer Hebrides, over Christmas 1900 may be likened to the mystery of the Mary Celeste. 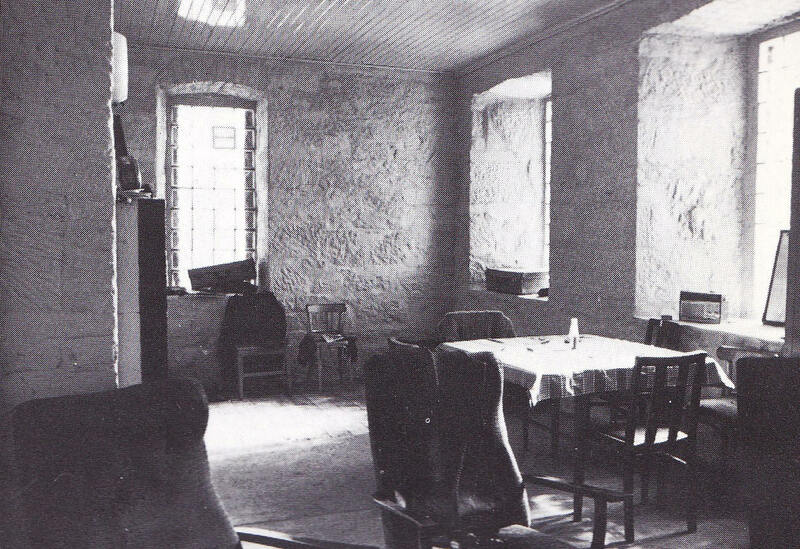 The cases share several motifs – the half-eaten meal, the living quarters left in good order, the utter absence of life – though the Flannans’ weird reputation has led several authors to speculate that the missing keepers may have been snatched by some supernatural power. 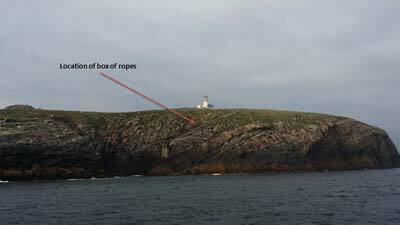 When the two men reached Eilean Mor, one man, Joseph Moore, went up to check the lighthouse for the three missing men. He found the entrance locked. 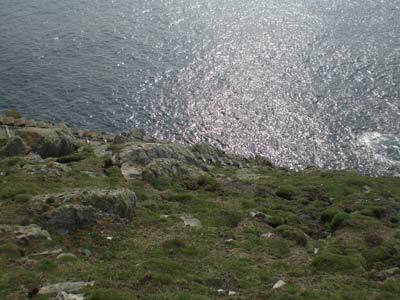 He unlocked the door and entered to find the Flannan Isles lighthouse unmanned. The clock on the wall had stopped, no fire was in the grate (nor had one been there for a few days), there was a meal sitting at the table. It looked like someone had set it down with the intention of eating it soon, but it was untouched. Whatever had happened to the men, it had happened to them suddenly. Дверь закрыта. кому придет в голову вообще закрывать дверь на необитаемом острове? Второе - по инструкции один чел всегда должен находиться на маяке, как на посту. почему все трое ушли??? Высота острова 150 футов. Это у нас такие волны запросто ходят? In fact, it would appear that the actual time of the disappearances must have been the early afternoon of Saturday 15 December. 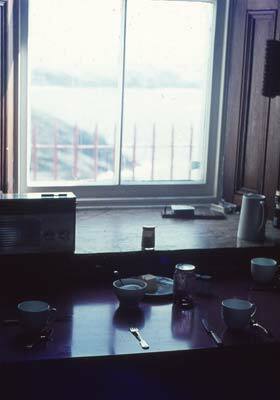 Muirhead observed that the morning’s work, including the trimming of the lamp and the filling of the oil fountains, had been completed and the men had eaten their dinner – then the midday meal – and done the washing-up. And, since the standing orders issued to the men on the island forbade all three to be out together after dark, leaving the light burning but untended, it must have been before nightfall – which, at that latitude, and that time of year, occurs before 4pm. Several secondary sources have suggested that the weather off the Hebrides that day was calm, and that the disappearance was therefore unlikely to be a consequence of bad weather. Certainly it is true that the greatest of that winter’s storms did not strike the Flannans until 20 December, almost a week later. Nevertheless, waves of 110 feet or more do not exist in the open sea, and are very seldom created even in the most extreme of local conditions, so it has always seemed permissible to doubt that such monstrous walls of water actually exist off the coast of Scotland. And if they do, it has always been difficult to imagine what could have driven the missing keepers out in such appalling weather conditions. Experienced lighthousemen, who know their primary duty is to keep their lamps burning, rarely go outside at all in heavy weather, certainly not all together. McArthur’s ‘wearing coat’, however, was still on its peg, ‘which shows,’ Moore noted, ‘as far as I know that he went out in his shirtsleeves’. It does not seem likely that the Occasional would have done this willingly in weather bad enough to have caused his companions to don their waterproofs, and this suggests that, whatever happened to the three missing men, it must have happened to Ducat and Marshall first, and that McArthur ran out of the lighthouse to aid them without waiting to don his coat. 1. They had already had time the previous week to secure the ropes, which was the supposed reason for going down to the West Landing area. 2. Even if they had gone down to the west landing that day then why did they leave it so late in the day when most Lighthouse keepers would tell you that jobs like this are usually done in the morning? The daylight would have been fading as well as it was mid-December. 3. Leading on from item 2, again why did they leave a trip to the West Landing so late in the day as the weather was getting worse, not better? It built up from the morning throughout the day until the early evening that day and then started to lessen in strength. 4. James Ducat had 22 years of experience of lighthouse keeping to call on. Would he have jeopardised his life and that of the others to walk down to a landing that was being hammered by winds and 30ft to 40ft waves which were building up to just below storm force? 5. Walter Aldebert's theory of a man being swept away by a freak wave is fairly credible but his theory took no account of the weather that day. In his report Aldebert suggests that "the wind lessens" - it didn't, it was getting worse from that morning right up until 6/7pm when it was just below storm force. Aldebert asks us to believe that one man either fell in or was swept away by a freak wave and then asks us to believe that another one then came along and swept the other two away as well. Помимо маяка, на острове есть еще одно здание - часовня св Фланнана. 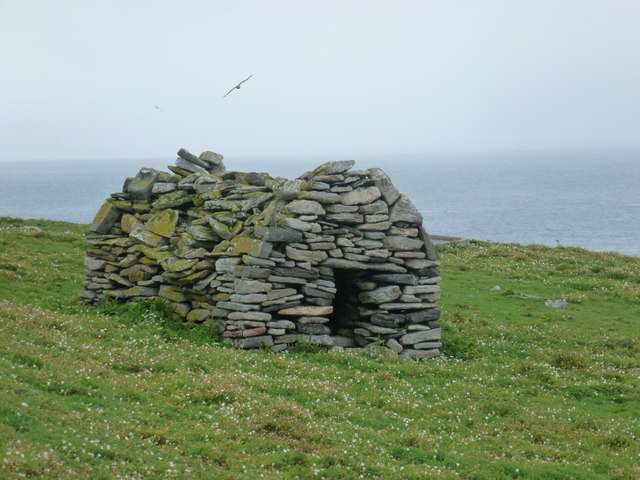 The ruins of a few crofter dwellings still stand on Eilean Tighe, but Eilean Mór, which is by some way the largest of the Flannans was, prior to the construction of the light, last certainly occupied in the seventh century by St Flannan. A very simple dry-stone building more or less in the centre of the main island, Eilean Mòr. It is dedicated to an Irish missionary-bishop, St. Flann or Flannan, after whom the whole group of islands is named. Маяк изнутри, считается, что обстановка не изменилась между фотографией и 1900 годом. Смыло с отметки 110 футов всех трех за один раз, скорее всего. Во-вторых, стул на кухне опрокинут был только один. В-третьих, волна в океане это одно, а у берега другое, гасится она на мелководье. В-четвертых, им там делать было нечего в это время. В тех условиях при тех широтах у них там пара часов до темноты оставалось. Скорее уж вариант с ветром, уж больно берег крутой, но все равно, что они там забыли?! Ну вот как вариант не сразу, а по очереди. Второй вышел искать первого и его тоже сдуло или смыло но он успел позвать третьего (или зацепился временно). Третий вышел на помощь второму и в процессе спасения обоих смыло-cдуло. Это же динамический сюжет какой-то: обычные люди в обычной ситуации исчезают. Совсем, навсегда. С концами. Но только люди, не сама обстановка и обыденность. Это беспокоит. Это порождает сон разума. В кино такой прием тоже любят использовать. С Бриггсом на Марии Селесте не все ясно, конечно. Однако, остальные сомнений не вызывают. Трудяги. Свежая идея: найти таблицу приливов на 15 декабря 1900 года для Гибридов. Если после обеда был отлив, то шансы на Мега волны падают ещё сильнее. At mid-afternoon that day (15 December 1900), the ship’s position had been 58° 29’ N and 11° 36’ W, approximately 120 miles west by north from the Flannan Islands. As the evening came on and the Archtor approached the Flannan Islands, the master of the vessel, Captain Holman, felt that something was not right. Despite searching constantly on the horizon as they came closer to the islands, there was only darkness, and even though there was a very heavy sea with a strong south-south-westerly wind, it was a clear night. 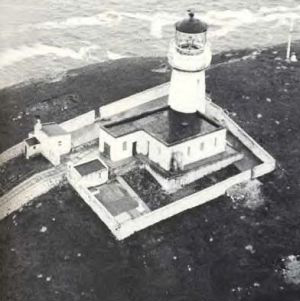 By midnight, the Archtor had reached a point that was estimated to be well within 5 miles to the north of the Flannan Islands and the relatively new lighthouse.3 Even with the changeover of watches at midnight there was still no sighting of the light. 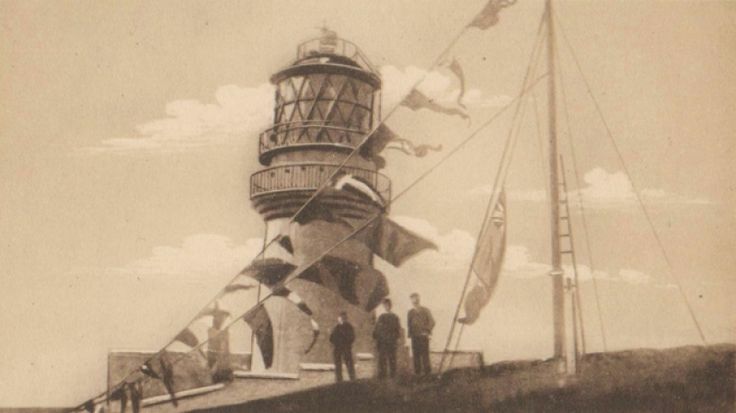 Once again, Captain Holman stood on the bridge and scanned the horizon to the south to search for the light from the Flannan Islands lighthouse, which had only been in operation for a year. В названии темы все раскрыто. Гибриды. Это явно Пу там отрабатывал ведение гибридных боевых действий. Кстати по поводу мегаволн - прочитал из Вики что в Атлантике на другом маяке в 1861 году волна залила лампы маяка на высоте 220 футов (67 метров) над уровнем моря. Видимо сложились скорость и высота набегающей воды. 1. Ха-ха-ха. В русском языке принято написание Гебриды. 2. А разве на мелководье, когда волна тормозится, ее высота не увеличивается? К вопросу о высоте прибоя. Это Мальта и там регулярно смывает в море людей во время зимних штормов. На мелководье волнение имеет характерные особенности. Здесь волны быстрее достигают максимальных размеров и быстрее затухают после прекращения ветра. Так, на мелководном Азовском море при скорости ветра 20 м/с волны достигают максимальных размеров примерно в течение часа. Даже при очень сильных ветрах размеры волн на мелководье меньше, чем в глубоководных районах, но зато они отличаются значительной крутизной. Максимальная высота волны на мелководье не может быть больше 0,8 глубины моря. Скорость и длина волн на мелководье уменьшаются, а период остается постоянным. Глубина моря начинает существенно влиять на высоту волн в тех случаях, когда она меньше 6—7 значений средней высоты волн. Таким образом, мелководные районы моря не имеют постоянных морских границ. Отражение волны от крутого берега приводит к удвоению её амплитуды на берегу. Если амплитуда набегающей волны 5 м, то при отражении на линии берега высота составит 10 м. Коэффициент отражения от берега-стенки близок к 1. Однако, если берег покатый, при выходе волны на мелководье происходит обрушение гребня. Оказывается, когда высота волны a сравнима с глубиной воды H, разница между скоростями движения «подошвы» волны и её гребня становится существенной. Вершина волны, скорость движения которой равна формула, догоняет подошву, движущуюся со скоростью формула, что и вызывает обрушение (рис. 6). Естественно, после этого коэффициент отражения становится существенно меньше единицы. Волновая энергия в этом случае расходуется на трение в бурлящем потоке. Надо смотреть метеорологические архивы, чтобы удостовериться какая была высота волн на то время. С волнами убийцами есть проблема-они описываются как одиночные, но их то по условиям требуется две, потому что третий погибший был не одет по погоде, хотя мог и должен был. 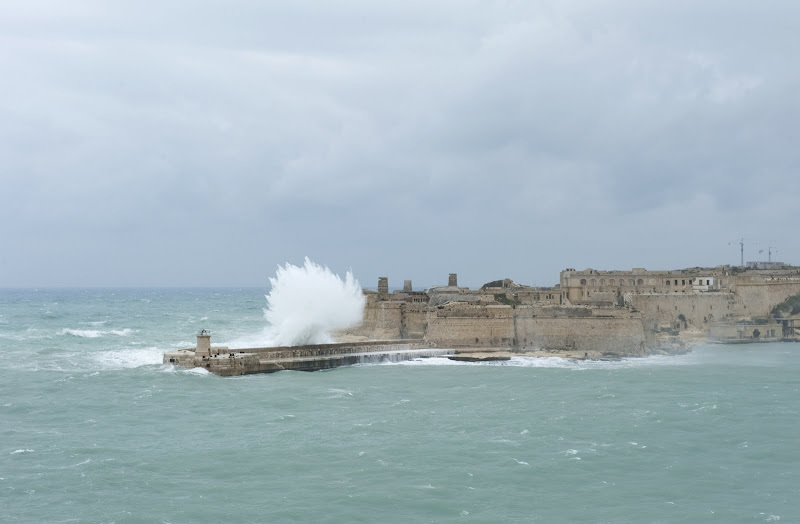 The shady phenomenon of freak waves as tall as 10 storey buildings has finally been proved, the European Space Agency (Esa) said on Wednesday. Sailors often whisper of monster waves when ships sink mysteriously but, until now, no one quite believed them. As part of a project called MaxWave - which was set up to test the rumours - two Esa satellites surveyed the oceans. During a three week period they detected 10 giant waves, all of which were over 25m (81ft) high. o prove the phenomenon or lay the rumours to rest, a consortium of 11 organisations from six EU countries founded MaxWave in December 2000. As part of the project, Esa tasked two of its Earth-scanning satellites, ERS-1 and ERS-2, to monitor the oceans with their radar. The radars sent back "imagettes" - pictures of the sea surface in a rectangle measuring 10 by 5km (6 by 2.5 miles), which were taken every 200km (120 miles). Around 30,000 separate imagettes were produced by the two satellites during a three-week period in 2001 - and the data was mathematically analysed. Esa says the survey revealed 10 massive waves - some nearly 30m (100 ft) high. Несколько более прозаическую версию событий высказал Уолтер Альдеберт, работавший смотрителем маяка в 1953-1957 годах. Он заметил однажды огромную волну, которая при совершенно ясной погоде двигалась точно на Эйлин-Мор сравнительно узким фронтом. К счастью, он находился внутри башни, хотя вода после удара докатилась чуть ли не до порога. В принципе, такие явления в океане вполне возможны. Вот Альдеберт и предположил, что двое смотрителей работали на причале, когда третий, заправлявший масло в светильники, увидел волну. Он бросился вниз, чтобы предупредить товарищей, но недооценил масштаб стихии. Так все трое и были унесены в море. А в центре Гренландского щита в декабре 1900 кто-то вел наблюдения? Там же Амундсен на лыжах бегал туда-сюда! Интервью с Алдебертом, такое впечатление, что ни фото, ни самого репорта никто, кроме репортера не видел. Walter Aldebert, now principal keeper at St Abb’s, Berwickshire, risked his life many times to prove his theory. His report, unofficial and personal, until now unpublished, is lodged, together with a set of his photographs, with the Commissioners of Northern Lighthouses in George-Street, Edinburgh. Said Mr Aldebert: “While I was at Flannan from 1953 to 1957, I would often sit there, putting myself in the place of the principal. “A storm is raging, and Mr Ducat is worried about his landing ropes. 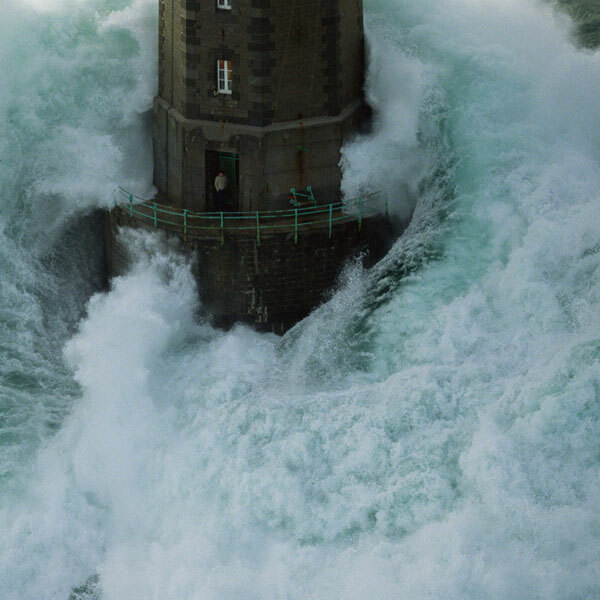 Nobody goes out of a lighthouse in bad weather, but if he loses his ropes relief may be impossible, and he must save them if he can. “After dinner the wind starts to drop. Leaving the cook to wash up, he and the other man put on their sea boots and coats and make their way to the west side, as there is no hand-rail by the railway. 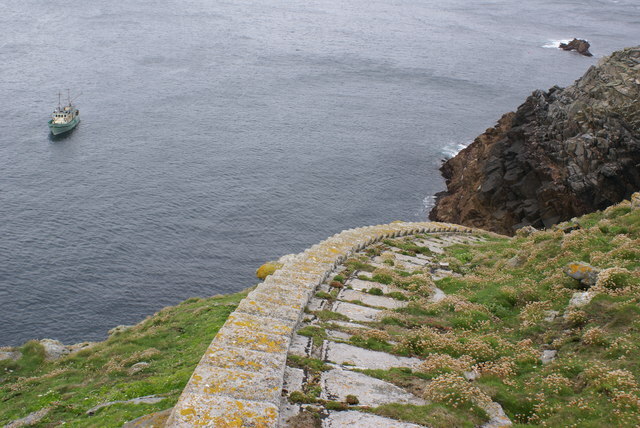 “They come to the safety path which has a hand-rail, reaching the path which runs at right angles to the stairway and, seeing the path dry, they continue towards the crane where the box for stowing the landing ropes is situated. Mr Aldebert believes the survivor – there is no means of saying which one – then made his way as quickly as possible up the 45 degree track to [the] shoulder and along the top to the lighthouse, shouting through the doorway that his mate has disappeared. “The cook who has just sat down after clearing the dinner, knocks his chair from under him and rushes out – without his coat. “Grabbing a heaving line, the two men make their way back to the West side, hoping to throw the line to their unfortunate comrade. Mr Aldebert used 30 spools of film – many of them ruined with water – to illustrate the size of waves striking the rock face. Repeatedly he went out in storms – the worst photographic conditions – crawling on his hands and knees, to get the shot that would prove that waves rose, not just 100ft high, not 150ft, but 200ft and more – well above the crane platform at the west landing. 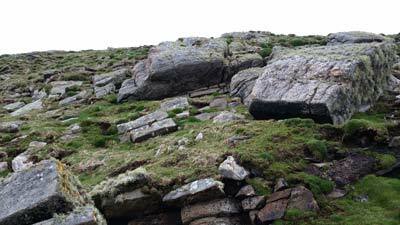 On the shoulder of the island, 200ft up, he was himself nearly washed off. He said: “A coil of rope, lying on top, and too solid to be shifted by the wind, was washed off. The water lay a foot deep after the wave receded. “Even the lamphouse, 330ft up, can be splashed with spray in a storm. My pictures do not show the highest waves, but they give some idea of their immensity. 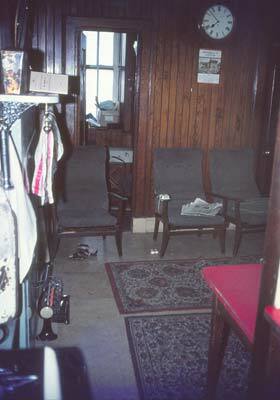 The processed film was submitted, with a report, to the Commissioners of the Northern Lighthouse Board. Unfortunately no trace of them can be found in the NLB records now at the Scottish Record Office. Получается что гипотеза о мегаволне удовлетворительно объясняет произошедшее? Да, причем, достаточно одной такой волны, если третий ее заметил из окна и побежал спасать остальных. Единственное возражение было, что двери здания были заперты, что противоречит версии, что третий бежал изо всех сил спасать остальных (раз он даже не оделся). Однако, как я вижу из протокола осмотра, дверь на кухню была открыта. I went up to the lighthouse and on coming to the entrance gate I found it closed. I made for the entrance door leading to the kitchen and storeroom and found it also closed, and the door inside that. But the kitchen door itself was open. On entering I looked at the fireplace and saw that the fire was not lighted for some days. I entered the rooms in succession and found the beds empty, just as they left them in the early morning. Отмечу еще смысловую разницу слов: closed (закрыта) и locked (заперта). Дверь может быть закрыта, но не заперта. Хотя, по смыслу именно отрывка, 2 двери были заперты, а третья с кухни открыта. Ну и, закрывая тему, упомяну еще одну версию, связанную с волнами. Nicholson (1995) offers an alternative idea for the demise of the keepers. The coastline of Eilean Mòr is deeply indented with narrow gullies called geos. The west landing, which is situated in such a geo, terminates in a cave. In high seas or storms, water would rush into the cave and then explode out again with considerable force. Nicholson speculates that McArthur may have seen a series of large waves approaching the island, and knowing the likely danger to his colleagues, ran down to warn them, only to suffer the same fate as well. ...the west landing at Eilean Mor is located in a narrow gully in the rock that terminates in a cave. During high seas or storms, water forced into the cave under pressure will return with explosive force. Идея в том, что волна, попадая в пещеру, из-за малости объема взрывным образом вырывается наружу и имеет достаточно силы смыть людей и вещи на большой высоте. в-третьих, автор этой теории (Кристофер Николсон) повторил все неверные детали, присущие этой истории. То есть, степень его осведомленности невысокая. There is, however, one explanation which appears to go some way to unravel the Flannan Isles mystery. It was put forward by men who regularly visited the island with their sheep, men who knew the peculiar wave forms and natural contours of Eilean Мог better than most. More importantly, it could explain the clues left on the island after the keepers had disappeared - something the official explanation had failed to do. The coastline of Eilean Mor is indented at several points by deep, narrow gullies called geos, into which the waves can travel unimpeded. The west landing stage was actually set in one of these geos known as Skiopageo, a narrowing creek some several hundred yards in length and terminating in a cave which became completely filled at high tide. 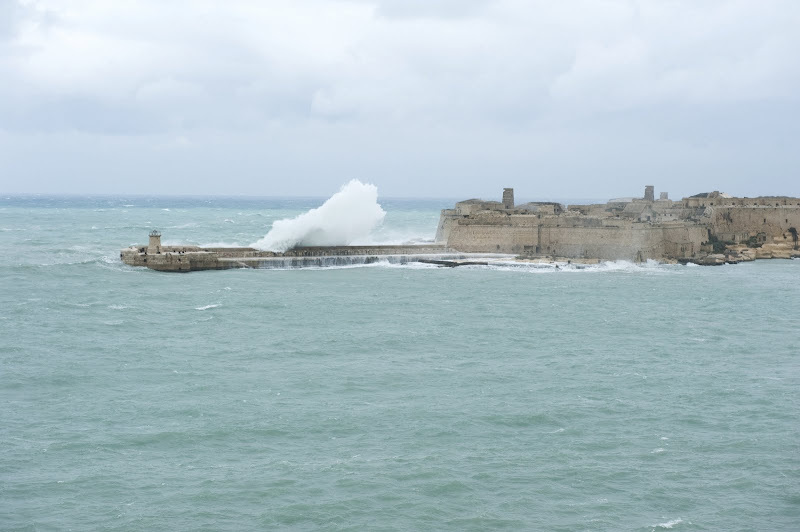 During times of storm the waves would rush into the inlet and compress the air in the cave, causing it to explode outwards sending curtains of spray and considerable volumes of water into the air. It was suggested that during the heavy seas on December 15 Ducat and Marshall went to check on the security of equipment at the west landing leaving McArthur to continue with the preparation of the meal. While doing this his attention was caught by a series of exceptional waves heading for the island from the open Atlantic. He well knew the force with which the cave at the end of Skiopageo could discharge its watery contents and so ran to warn his fellows of the approaching danger, leaving his waterproofs and knocking over a chair in his haste. By the time he reached the others it was too late and all three were swept into the sea by the sheer weight of descending water. Еще фотки, чтобы разглядеть двери.